For some reasons, the front shifter of my bicycle stopped working properly. Time to take a screwdriver and see how the shifter actually works. I see an opportunity in every broken thing: dissassembling it or attempting to fix it involves no risk since it is already broken. Thus, I took a screwdriver and disassembled the indexed front shifter of my bike in order to understand how it works and hopefully make it work again. By comparing the broken front shifter with the fully functioning rear shifter, I could locate the problem. 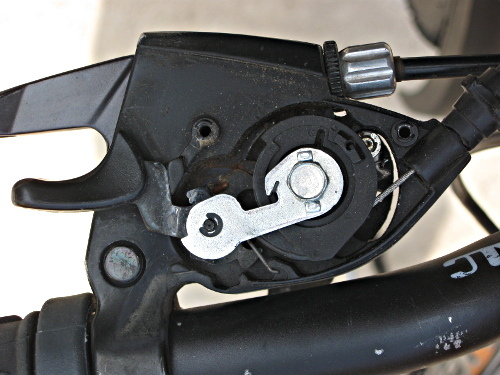 The shifter uses a ratcheting mechanism for pulling or releasing the derailleur cable. The prawl (a spring-loaded finger of the ratcheting mechanism) did not properly touch the gear. The force applied by the thumb makes the prawl move but if the prawl does not touch the gear, nothing will happen. Just by fiddling a little bit with the prawl and its spring, the front shifter worked again.